I was in Nordstrom Rack and saw a woman in her early sixties looking at sweatpants that had the above printed on the leg. The way she was fondling them, holding them up against her and checking sizes made it appear as if she were shopping for herself, not someone else. I don't understand people who wear clothing with stuff like this printed on it. It's never appropriate, or cute, or clever no matter what your age, but when you're pushing retirement, it's just disgusting. 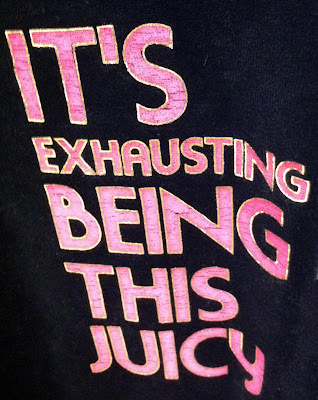 No one wants to imagine you being "juicy". 2 YEARS AGO: What’s In A Name?